Our 1" thick, durable laminate desktops are GREENGUARD-certified and come in cherry, maple, mahogany, ash gray, walnut, black, white, and whiteboard. Laminate wood finishes provides a stylish, wood-like desk surface at a fraction of the cost of solid wood. Our Eco desktops are UV-cured, powder-coated and made of 100% recycled wood composite. Using recycled materials means less waste in our landfills, for a desktop that is high quality and won't weigh on your conscience. Eco desktops are available in both black or white for a classic look. GREENGUARD-certified laminate desktops are 30" deep and available in 48" - 80" widths. Our laminate desktops are 1" thick, for a durable work surface that you can put to good use for years to come. You rely on your desk to take you to that next level of work in the office. When you're ready to work at a desk that rises to your expectations, we give to you the UPLIFT V2 Laminate Standing Desk. Both Wirecutter's and Forbes's top choice in the "Best Standing Desk" category, this desk raises the bar on efficiency, stability, and innovation, giving you a desk that does more. And when it comes to durability, affordability, and quality, our GREENGUARD-certified laminate desktops don't disappoint, and come in a wide variety of styles to match your space. Work better knowing that when you invest in an UPLIFT Desk, you're getting the most advanced sit-stand desk available. Learn more about both the UPLIFT V2 Frame and the UPLIFT V2 Commercial Frame—and to compare the differences between them. It's your choice of several different GREENGUARD-certified laminate finishes on your UPLIFT V2 Laminate Standing Desk. At 1" thick, these durable desktops are made from eco-friendly, recycled MDF. Outfit your desk in black or white—or if you're a fan of woodgrain, choose from walnut, maple, cherry, or ash gray finishes. GREENGUARD certification ensures that these desktops have been tested for chemical emissions, meaning these tops have met the standards set by seven different regulating bodies, ensuring your desk is safe for you and your indoor air quality. What Sets UPLIFT Desk Apart? 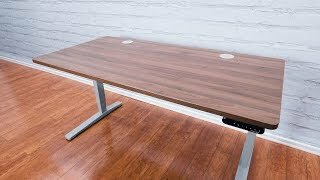 When you're looking for a sit-stand desk that can help you accomplish more throughout the day, look no further than the UPLIFT V2 Laminate Standing Desk. The designers at UPLIFT Desk took their most popular desk frame and made it even better. Work with improved stability at all heights, safety during movement, reliability you can trust, and a new versatile desk design complete with built-in mounting points. Make your desk your own by installing desk accessories directly to your UPLIFT V2 Frame. With this much freedom, you can now truly create the height adjustable workstation of your dreams. Click here to learn more about the differences between the UPLIFT V2 Frame and UPLIFT V2 Commercial Frame. The UPLIFT V2 Commercial Frame features a height range of 22.6" - 48.7" with a 1" desktop installed. It also has a lower starting height, a lower max height, and a wider overall height range than the UPLIFT V2 Frame. This contract-grade frame meets and exceeds ANSI/BIFMA durability standards, while also meeting the ANSI/BIFMA G1-2013 height standard, a standard required by many of the world's largest companies. Although you might be admiring it for its sleek design, it's what's inside and hidden from view that will change how you think about what sit-stand desks can do. Four dozen independent, patent-pending mounting points let you use your desk in a whole new set of ways with our growing collection of desk accessories. Now you can attach accessories directly to your desk frame, letting you adapt your desk to your exact needs. With accessories planned for release like desk extensions, CPU holders, and power strips—and even fun accessories like an under-desk hammock—your desk will be ready for pretty much anything and everything. A quick note: the hammock is only compatible with the UPLIFT V2 Frame. It’s not compatible with the UPLIFT V2 Commercial Frame due to the fact that it interferes with its stability crossbar. When you upgrade to the Advanced Keypad, not only do you save time by not having to hold down buttons—you get to enjoy extra features, too. Work will feel seamless when adjusting your desk thanks to quick one-touch adjustments on the Advanced Keypad's four programmable buttons. Switch between sitting, standing, perching, and all of your postures in a few seconds, giving you the perfect amount of time to move your chair. Anti-collision sensitivity and keypad child lock are two improved safety features that were added to the UPLIFT V2 to make sure your desk provides only the safest height adjustments. If your desk does come into contact with people or objects, it will stop quickly and slightly reverse, allowing you to remove whatever was in the way. Keypad child lock lets you lock your desk's height, a feature that really comes in handy when there are little ones nearby. You'll also have the ability to set your desk's maximum and minimum heights, preventing your desktop from knocking into shelves above or file cabinets below. And to reduce distractions at your desk and in your area, you'll appreciate the Advanced Keypad's auto-dark LED display, which dims the keypad to distraction-free darkness 10 seconds after you press a button. How will this desktop hold up? Laminate is a reliable and sturdy material that holds up well over time. Designed with durability in mind, our laminate options are affordable desktops that allow you to get the look of real wood for a fraction of the price. Laminate—Isn't that a little dated? Although laminate furniture has been around for a few decades, times are changing. We work with our designers to create only the most stylish and eye-catching desktops to pair with your UPLIFT V2 Frame. We exclusively offer Wilsonart certified laminates, which come with some of the most diverse finish options around, so you can pick the exact finish that matches your personality and office style. What are these desktops made out of? The laminate we use is composed of thermally-fused melamine laminate over 45 lb density E-1 rated particle board core, and comes with a 3 mm PCV edge banding for a clean and seamless look around the edges. All of the layers of the are fused under extremely high pressure to form a solid surface that's durable enough to withstand years of work. And at a full inch thick, our desktops are much thicker than the laminate desktop thicknesses offered by our competitors. Is this desk suitable for sewing? Yes, our laminate desks are great for sewing and crafting. Can I add my own desktop to this? Yes, you can install your own desktop to the UPLIFT V2 Frame. You should be able to assemble the desk frame and attach it to the desktop solo. However, you will need two people to safely turn the desk right-side up after assembly. The Human Solution customer service provides excellent service as well. I had sent in an e-mail request for a copy of my invoice, which I had misplaced and they had it to me within the hour. LOVE this desk. Well made, quality materials, easy to assemble, quiet.... I have nothing negative so say about this product. I was even impressed with how well it was packaged/protected for shipping. My desk was delivered on Friday. I didn't have time to assemble it until Sunday. I wanted to have plenty of time. Desk assembly instructions were very clear and told you everything you needed to know to avoid making any mistakes. Assembled the desk and plugged it in and it worked just fine. Love the look and sturdiness of the desk. When I ordered, also received box set of some desk top items and a standing matt. All looks great and very functional. Price was affordable as well. Love it! Better than you can imagine! I've been working mostly standing since about 2010, and have used various adjustable desktop risers, one-piece platforms, etc. The last 3-4 years I have been working from home, where I also use a home computer, gaming setup, and a walking treadmill. The problem was that none of my previous pieces offered a solution for ALL my equipment and constantly changing levels (sit/stand/elevated standing on treadmill). All I had was a mish-mash of different equipment, and a constant need to change this around when switching from work to home, or for gaming. That ended when I got this desk. At 80" in length, it will hold all my work, home, and gaming paraphernalia; the sturdy construction ensures no sagging or weakening in holding 2-3 sets of equipment and monitors; the simple height adjustment makes it a breeze to switch my own level without having to constantly modify positioning of any of my equipment; and finally, I can get the most personal benefit overall with the least amount of aggravation - NONE. Definitely glad I went this route! I tried out a standing keyboard stand for 6 months at work, and loved standing, but didn't love my monitors being too low. I purchased a 30x60 black eco desk for my keyboard and 2 monitors. I loved it so much, I purchased a second 30x80 black eco desk to make an 'L' shaped desk and can meet with my clients on the second desk. It is so nice to be able to stand/sit at the push of a button. The first table took about 2 hours to assemble, and the second only took an hour since I knew how it went together. I will be bragging the product up to everyone. Thank you!! I made the decision to try a standing desk and chose the desk from HumanSolution. My old desk was 72 inches (1.82 m) wide and 36 inches (0.91 m) in depth. This desk is 72 inches wide by 30 inches (0.76 m) wide. I miss the extra width, but not enough to go back to the old desk. The instructions for assembly were very good and it was easy putting the table together. It was a bit more of a challenge adding the CPU holder, keyboard holder and the half-circle drawer, but the instructions were very helpful. I did watch one of the videos and that was extremely helpful. I really like the height adjustment. I've created 3 heights to work at and it goes back and forth each each of the set heights that I selected. The only disappointment I have with this desk is that it tends to bow in the middle even with the crossbar center rails installed. This desk was generally easy to put together, i did it myself :) it took me about 2 hours. When you adjust the height, you can hear that the motor is good quality, nothing looks or sounds cheap about this desk. The work space is nice and big, I got the 60". It fits both my monitors vey nice with room to spare for other things. There are cheaper desks, but this one was definitely worth the money. I'm really happy about my impulse purchase lol! It's a solid well balanced desk that performs as advertised. That's to say all the raves are justified. The accessories are well integrated and I regret that I didn't buy more with my initial order because now I'm paying freight to get them here. But, I couldn't be more impressed - especially when I compare this product to what it available in the office supply store and the like. But for those of you not standing up, whoa! I am so much more productive and alert, instead of a lump of coal a couple of hours into my day! $495.00 List Price: $899.00* The list price is the same as the MSRP (Manufacturer's Suggested Retail Price). It may not necessarily be the price at which the product is sold.